08.02.2017 | Hauppauge, New York, USA – Magic Silk and Male Power are “in bed together,” joining forces to present their latest line of novelty women’s and men’s underwear – Kiss Me. These lip-smackingly delicious and adorable garments are available just in time for the most romantic holiday of them all, Valentine’s Day. The lingerie is made from ultra soft black mesh, imprinted with a passionately peckable pattern of ruby red lips. The print offers just a tantalizi ng glimpse of the treasure that lies beneath. As comfortable as a caress, these styles conform and accentuate all body types. Women can slip into three smoochable styles: Fly Away Baby Doll and Short Set, Cupless and Crotchless Teddy, and Chemise & G-string Set. They are accented with such features as adjustable shoulder straps, flirty ruffle trim, and adjustable/removable garter straps. Sizes include s/m, l/x and queen (fits 1-3x). Men have two attractive choices. The Mini Short is the most popular body style in the Male Power line, with its high cut legs and low rise waist. The Micro Thong has a V-shaped fabric patch in back, and is accented with a plush, logo embossed waistband. All of the garments have great hanger appeal, but are also sold in beautiful, upscale packaging. Immediate delivery is available. Put Kiss Me on your display rack right away and you’ll really make out on February 14th, and every other day of passion and romance. 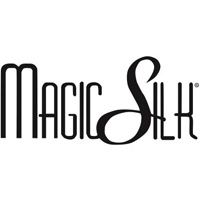 Find out more at www.magicsilk.com and www.malepower.com.